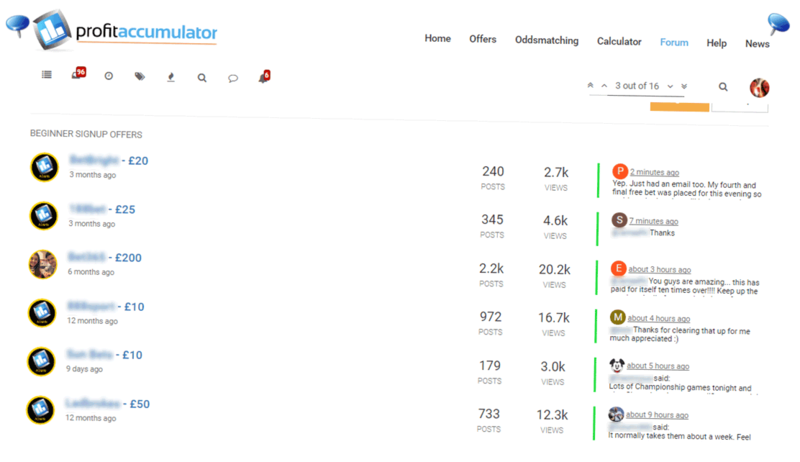 Established by Sam Stoffel in September 2014, Profit Accumulator provides information to over 20,000 active members on how to make risk free profits by taking advantage of bookmaker free bets and promotions. When I made the leap of faith to join, I had my doubts, probably just like you do right now. I’m thankful ten fold I joined, my life has changed for the better for sure. If you want to know what it’s all about then you’re in the right place. When I joined there were 1500 Platinum members, now there are over 20000. The number of members using this service is enough to stir up anyone’s curiosity. As you will see in a moment, absolutely everyone I have introduced to Profit Accumulator is loving it and using the money they make to better their lives. What would you do with an extra £500 or even £1000 a month? It’s totally possible. This is the one question you will want answering the most due to the nature of making money on the internet. I can honestly say, hand on heart, that it is nothing of the sort. Sam, the CEO lists his phone number and office address on the site’s contact page (Click contact at the bottom). He has an office in Covent Garden, London so why not give Sam and his team a quick call if you feel in any way it is a scam. Scam sites NEVER list a trading address or phone number – Profit Accumulator does. Scam sites don’t let you register for free – Profit Accumulator does. You can register for free with Profit Accumulator and try it. You even make money whilst trying it for free! What service do Profit Accumulator provide? 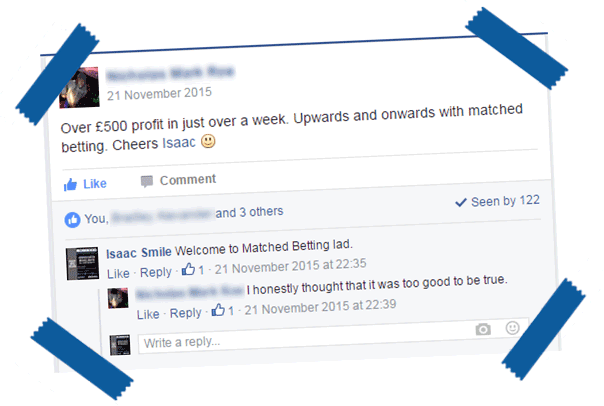 Profit Accumulator enable people like you and me to take part in matched betting – the easy way. You could go it alone without a membership but it would take you a lot longer to bring in the same figures possible with Profit Accumulator. You see, what the PA staff do every day is evaluate each promotion the bookmakers are running. They read all the terms and conditions and calculate if it is worth doing. 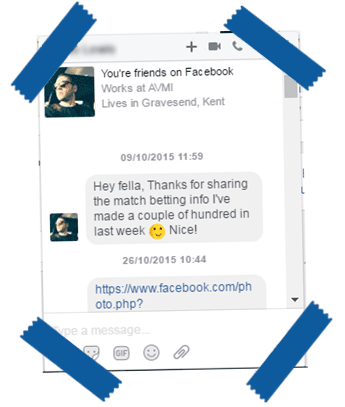 Some offers aren’t and you needn’t waste your time with them. The Profit Accumulator team list exactly how to turn the promotion into withdrawable cash in clear easy to follow tutorials. 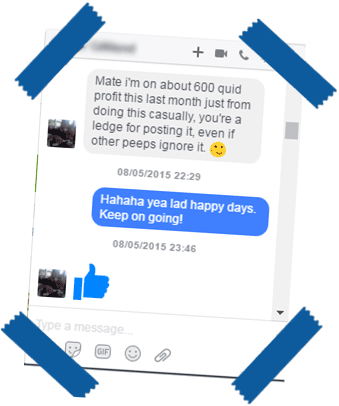 The idea is that you get yourself a free account, watch the training videos that walk you through how Matched Betting works. 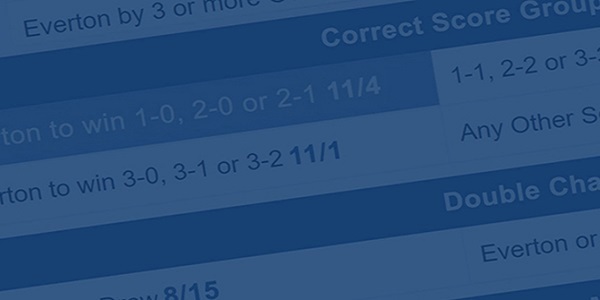 Next you’re shown how to take advantage of two bookie promotions that will make you about £40. Scam sites NEVER list a trading address or phone number - Profit Accumulator does. Then, after making a quick £40 if you want to continue making easy money you upgrade the account to Platinum. Which is exactly what I did. 9 out of 10 people who try Profit Accumulators free trial upgrade to the platinum membership. In the unlikely event you’re not happy there is a no questions asked 30-day money back guarantee. By trying the free trial you have everything to gain and absolutely nothing to lose – It’s free! What would you do with this kind of money? It is life changing for most. After the training and introductory offers you must decide if you want to earn continuously from Matched Betting. The cost of a platinum membership is £17.99/month or £150/year. Remember, you will have just made £40 in a couple of hours whilst completing the basic training . With a Platinum membership you can continue to earn way more than that. I would highly recommend continuing with Profit Accumulator. 20,000 others have and haven’t looked back since. I like to say that PA is an enabler site because it enables you to matched bet faster, quicker and smarter. 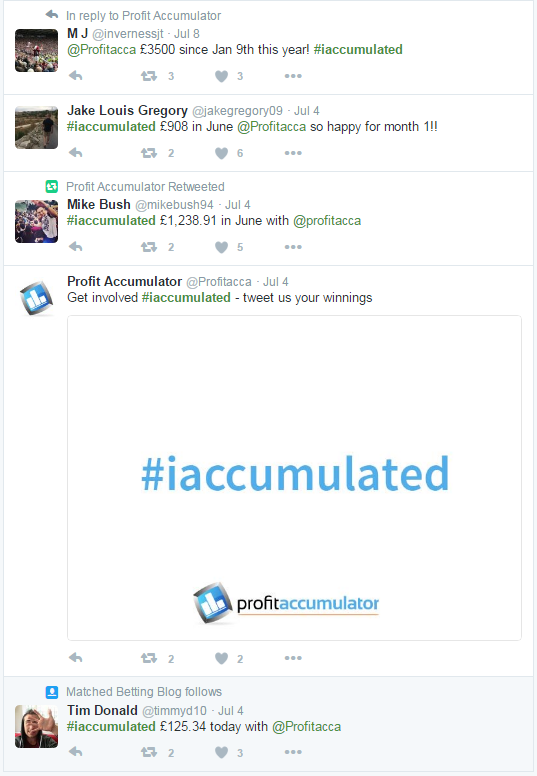 Profit Accumulator has over 20,000 members making it the worlds largest matched betting social network. Members are all part of one large community. People pull together and help and motivate each other daily. Members are very quick to assist each other so any queries you may have whilst working your way through a promotion are answered promptly. Support for each promotion is provided through the awesome platinum members forum but remember if that isn’t enough you can always call the office and get one to one assistance. 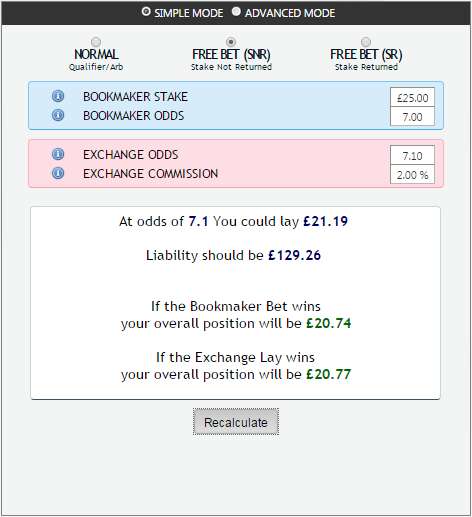 The Oddsmatching software helps us find close odds between the bookie and the exchange, an essential part to matched betting as you will find during the training. This tool is a massive time saver, finding similar odds manually, can take time. The matched betting calculator allows us to work out exactly how much profit we will make regardless of the outcome (Nice!) We matched betters call this “locking in profit”. Once you get stuck into the highly profitable reload offers you will find Match Catcher tool and Acca Catcher tools extremely useful in generating continuous profits. Profit Accumulator were first to develop such tools and bring them to market. All the tools you need are included in the membership fee. The new site has a slick new look and a few nice new features. Each offer is rated by PA staff so you know how it compares against other offers. The more stars the better the offer. There is no official word weather 5 stars means the offer is very profitable or if it is easy to do but from having a look through the offers myself 5 stars seems mean its quick and easy cash. The way you mark offers as complete works much smoother now and it’s easy to toggle between complete and incomplete offers. One of the nicest features is that in the Reloads section (Where you make the most cash) The offers can be sorted so those with the highest star rating are at the top. There is also a new tab for checking out reload offers that are not yet live, useful for planning. So what tools do I need? Choose The Free Account And Make £40 Today! How much money could I make from matched betting? Anything from £300 to £2,000 a month is possible. £300 would be minimal effort, like 30 – 40 minutes about 4 days a week. £1000 would mean dedicating about an hour a day. The amount you earn depends on the time you put in and how much profit you keep to one side to build your matched betting bank. There are £2000 worth of sign up offers, so doing those at a minimum is an absolute no brainer, you may as well at the very least take the easy £2k the bookies are willing to literally give away. If after that you want more there are tonnes of promotions for existing customers, so there is never a shortage, which means free money all year round. Yes. As long as you are over the age of 18, live in Great Britain and can follow basic instructions taught to you via video tutorials. How much time should I spend matched betting a day? How much money do you want? I would say learn the basics and take it slowly, read the platinum members forum and watch the video tutorials on Profit Accumulator, you should spend between 30 and 60 minutes a day. The greatest part about matched betting is that it is risk free so long as you take you time and get the bets right. It is a beautiful thing. If you do place an incorrect bet, then there are ways to correct your mistakes. You will learn all about that over at Profit Accumulators amazing platinum members forum. Yes. The Guardian, The Telegraph, The Times, Martin Lewis’ Money Saving Expert and The Huffington Post have all covered the subject and highly recommend it. Won’t I run out of bookmakers? Bookmakers award repeat bonuses and free bet promotions to existing customers (we call them reload offers) and a few times a year new bookmakers will open up shop. So…no you will never run out of bookmakers. What equipment do I need to start matched betting? Matched betting is much easier if you use a desktop or laptop computer, it doesn’t matter if it is Windows or a Mac, both work fine. I have managed to use my smartphone without issue when out and about, it’s just a bit slower. A quick tip for you – If you have a tablet then you can use it as a second monitor by using it exclusively for viewing bookies websites via their apps whilst using your desktop as your exchange screen. That way you can quickly zip from one to the other and make quick bets. Remember when matched betting on the go (not recommended) ensure you won’t run out of data, signal or battery half way through a promotion. Will online betting affect my credit score? No. You can and should separate your matched betting activity from your current account so that you can easily keep track of what you earn. It will also mean that your main account is not peppered with bookie deposits. I opened up a new bank account especially for matched betting and was given £100 for doing so! A nice sum to start matched betting with. You should also consider a ffrees account for your matched betting. Keeping everything separate is very important and will pay off in the long run. Do All The Bookmakers Use Paypal? Most do, but the key here is that if you deposit with PayPal for a sign up offer some bookmakers not credit you the free bet, you should be sure to read up about the offer on the Profit Accumulator site as they state if PayPal is allowed or not for each offer. Will I need to show ID to bookmakers? Yes at some point you will do, sometimes straight away and other times when you try to withdraw funds. I’ve used both my passport and driving license as ID. Keep a digital copy of your passport or driving license and a recent utility bill on your computer to make the process quick and painless. This is completely normal and there is nothing to worry about when doing this. Join Today And Give Yourself An Instant Payrise! Review of Profit Accumulator Platinum membership.